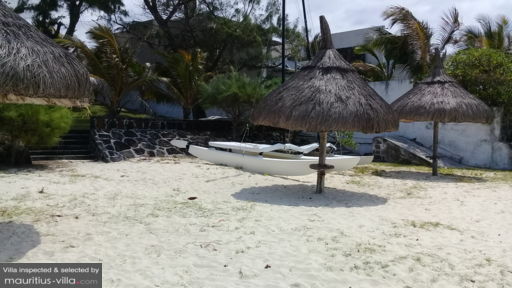 Located in a scenic fisherman village with plenty of sunlight, even in the winter, Villa Parasol boasts a spacious and cozy layout, ideal for the perfect vacation in Mauritius. With the beach right on your doorstep, this villa places you right by the sparkling ocean, consequently enabling you to go for a refreshing swim just about any time you want. With no less than five bedrooms at your disposal, Villa Parasol is conceived to very comfortably sleep up to ten guests. Additional guests can be accommodated upon request, at an extra fee. The bedrooms are themed, enabling guests to choose from The Purple Room, The Indigo Butterflies Room, The Room of the Rising Sun, The Wooden Room and the Turquoise office. All the rooms offer spectacular views of the ocean, pool or garden. Two of the bedrooms have terraces and guests share three bathrooms between them. Additionally, the bedrooms are equipped with air conditioners or fans to shelter you from the typical island heat. Villa Parasol has a spectacular tropical garden which comes complete with a large and gloriously refreshing swimming pool. Best of all, the infinity pool overlooks the lagoon, creating the optical illusion that it stretches right out into the ocean. With plenty of plants all around, guests will be able to enjoy as much shade as they want. By the same token, guests who want to work on their tan can simply step out onto their private stretch of beach. 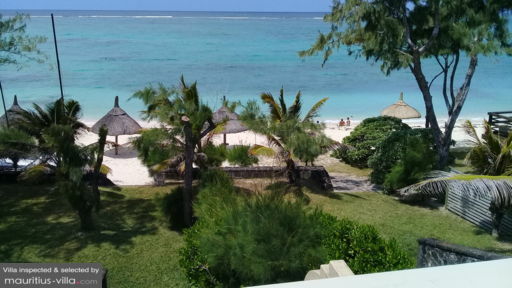 Indeed, with the sea right on your doorstep, there are plenty of opportunities for you to go snorkeling, swimming or simply lie back on the soft white sand as you soak in the tropical rays. 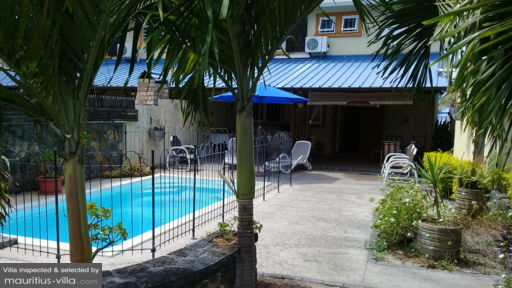 Outside, guests will also find barbecue facilities for fun Al Fresco meals with friends and family. Both the living and dining room overlook the bay, providing you with a fresh sea breeze every day. The living areas are tastefully decorated, in warm blues and greens that echo the distinctively tropical feel of the villa. In the living room, you will also find highly comfortable wicker furniture where you can lounge back and relax after a busy day of exploring everything that Mauritius has to offer. The dining room is extremely spacious and can easily accommodate extra guests. In the kitchen, guests of Villa Parasol will be able to make full use of the various equipment and amenities that have been set up so you can prepare your meals in the intimacy of your own villa. As a guest of Villa Parasol, you will be able to enjoy various types of servicesto enhance your stay. For example, a housemaid stops by on a daily basis to take care of the cleaning up, ensuring that you won’t have to deal with such tedious tasks during your stay. Similarly, the lush green grounds are regularly maintained by a gardener. These services are complimentary, but you can also browse through a list of paid facilities such as an in-house chef, bike rental, car rental and airport transfers. Because it is found in the sunny fisherman village of Trou d’Eau Douce, guests will always find plenty to do and explore nearby. For example, Villa Parasol can arrange for various types of excursions such as Fishing with Professionals. In this adventure, you’ll get to go deeper into the ocean as you join the local fishermen for an early morning fishing session. For an added thrill, you can even opt for a session of Big Game Fishing. A golf course can also be found ten minutes away from the villa.